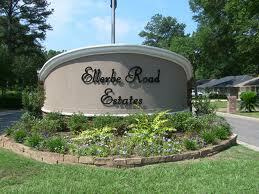 South of Shreveport and to the east of I-49 there is a quaint and lovely neighborhood called Ellerbe Road Estates. The majority of these charming brick homes were built between the mid 1970’s and mid 1980’s. Being removed from the central hustle and bustle of town affords many wonderful qualities. Much pine tree growth remains in this part of town, along Ellerbe Rd. and in the yards of the properties. This lends a great deal of natural beauty as well as shade, privacy, and some interesting bird life. Another noteworthy feature is of course the calm and cleanliness associated with living somewhat away from the business of city life. This neighborhood retains the desired peacefulness of the overall location. However, an easy one and a half mile trip over to Bert Kouns Industrial Loop can provide you convenient access to the heart of commerce in Shreveport, as well as Willis Knighton Pierremont and Christus Schumpert Highland hospitals to the East, or Willis Knighton South to the West by only a few miles. Caddo parish schools serving Ellerbe Road Estates are University Elementary School, Youree Drive Middle School, and Captain Shreve High School, with the magnet school Eden Gardens Fundamental Elementary School being another close public school option. If you are looking to live in Shreveport but just a little bit outside the central part of town this area is a beautiful choice: a pleasing combination of unique and varied houses, nature, and still reasonably quick access to town.